If you have set up an account and obtained a password to use Access ACS (see church member information), you can make either one-time or recurring automatic payments. Payments may be made through a credit card account or directly from your bank account. To set up a payment, use the automatic payment form available as a link from this web site, through the Access ACS site, or through the ACS churchlife mobile device application. The automatic payment form can also be used without a password, but only for one-time payments. Choose the “Continue as Guest” option on the second screen. You can ask the church administrator to establish a one-time or recurring automatic payment on your behalf. Send an email with this request to admin@mvuc.org. Stewardship – a payment toward a stewardship commitment. Contributions – a payment intended for operating fund expenses, but not associated with a stewardship commitment. Share the Plate, Monthly Charity Only, or name of charity – see info here. Endowment Fund – a contribution to the Endowment Fund. If intended as a memorial contribution, please indicate the memorialized person in the optional memo window. Rental fees – provides a convenient way for facility rental fees to be paid by credit card. Our automatic payment form allows you to choose between credit card or on-line automated clearinghouse (ACH) payments. The church pays a fee of about 3 percent for every credit card transaction. There is no fee for ACH payments, which transfer funds directly from your bank account to MVUC’s bank account, so this is our preferred method for automatic payments. To set up a credit card account, click on “Add a New Payment Method”, choose “Credit/Debit Card” in the Account Type box, and enter credit card information as you normally would for an on-line purchase. To set up an ACH account, click on “Add a New Payment Method”, choose “Checking” or “Savings” in the Account Type box. 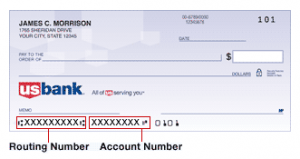 Enter account and routing numbers found on one of your checks, as shown on the illustration below, and other requested information.